Not far from the shores of Copenhagen, situated in the vaulted 17th century cellars of Moltkes Palace, lies the two Michelin star restaurant AOC, the most exciting addition to the clan of fine dining institutions that grace the city. 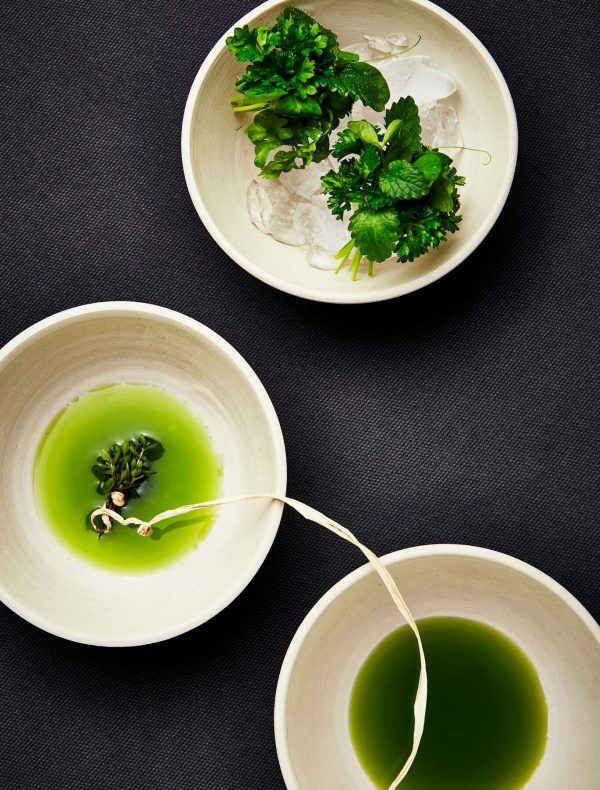 Akin to the world-famous Noma and Geranium in quality, but unique and distinct with its own lofty Nordic edge, AOC, nominated as Denmark’s Best Restaurant’ a few years back, marks an overwhelmingly outstanding dining experience that is difficult to forget. Owners Head Sommelier Christian Aaro and Head Chef Soren Selin are all about synaesthesia. 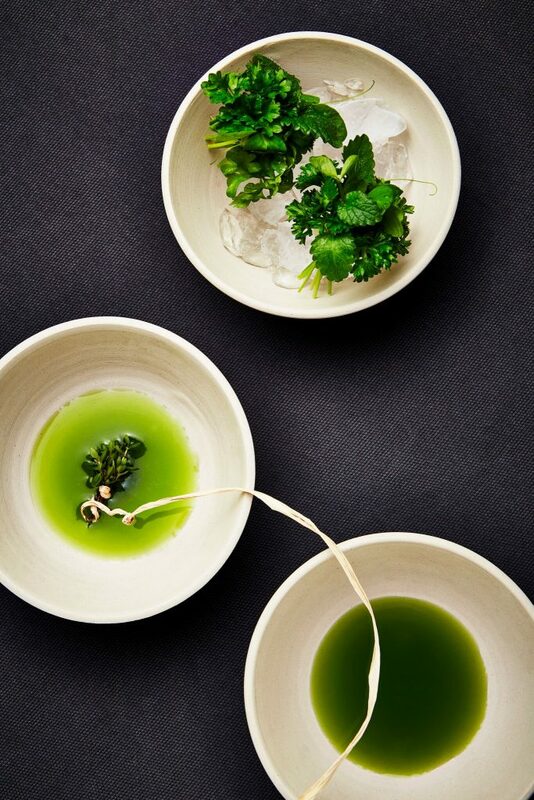 Yearning to stimulate all of our senses, their food is one of modernism and innovation applied to local, Nordic ingredients. Using only, of course, the freshest and most premium ingredients, captured right from their purest source in nature’s wilds, the food is emphatically synaesthetic yet light and elegant. Head sommelier Christian Aaro, meanwhile, supplements each dish with a meticulously paired wine, ensuring a finale of aromas, tastes, and textures that makes each course stand out. In the true spirit of synaesthetic stimulation, each course is presented in its most colourful, curious, and aesthetically appealing arrangement in a way that demands both attention and salivation. 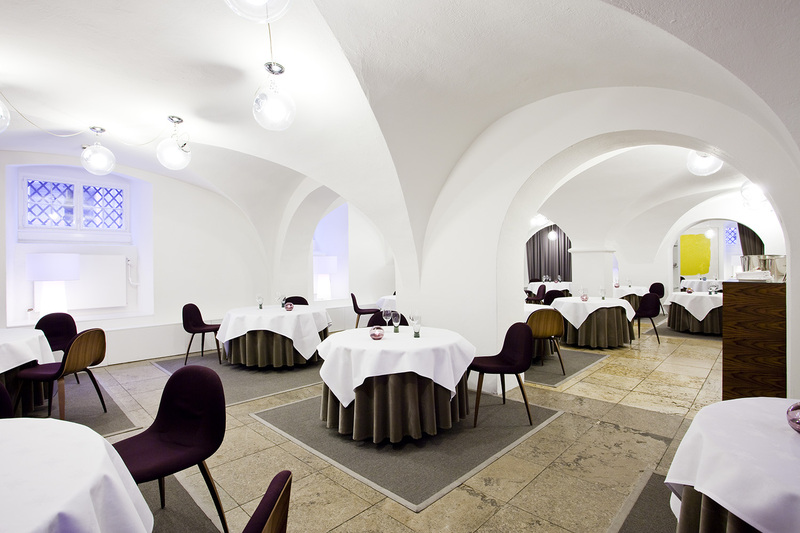 With a small space for only 40 guests, diners can choose to experience AOC’s delicacies either through a multi-course tasting menu, that changes six times a year, or as a smaller menu of a ‘little less. We made our way down AOC’s plush carpet into its vaulted cellars on a warm Friday night at 7pm, to find an already bustling restaurant space. Greeted warmly by its generous hosts, we were taken to the lounge area to enjoy an aperitif and ‘snacks’ before making our way to the main table. The lounge, redolent of a dark living room with relaxed sofas and armchairs to recline in, is where Sommelier Aaro made us feel at home with an offering of three different champagnes – a Danish, a Pinot Noir blend and a sparkling rose. The Danish was actually surprisingly good, a 2014 Don’s Cuvee from the Regional vin Jylland Skærsøgaard vin, but we had the fantastic Pinot Noir – a brut nature Fidele from Vouette & Sorbee – which unfolded wonderfully into a complex, luscious mouthful. The dining experience at AOC begins with this champagne and a series of small, light, unusual ‘snacks’ that they bring over the course of the first ten to twenty minutes. The first of these was a tiny Danish baby cucumber with spicy vinegar and spruce salt. This was served with a small baby gem lettuce hearts in a delicious, yoghurt-kefir like dressing called ‘grandmother dressing’, and served with green mirabelles and wild garlic capers . The second was a cute baby corn served in its own husk, topped with chamomile spray, presented interactively so that you had to peel it out yourself. The third was a delicious crispy potato with leek cream and leek flower (very more-ish), whilst the fourth was a fascinating, green salad of ‘reindeer moss’ that had been delicately fried, served with a Karl Johan mushroom powder, a dip of yogurt and sour truffle cream. The fifth (yes, there were many), was a little celeriac baked in a clay oven, served in a hay nest and sprayed with vinegar, served with a dip made of white fish roe, and a brown butter cream, presented like a little egg and yolk. To eat it, one had to mix the dip together, and spread onto the nutty, delicious celeriac. Lovely. The final ‘snack’ was a gratinated witch flounder cooked on the bones, served with a hollandaise sauce on top. 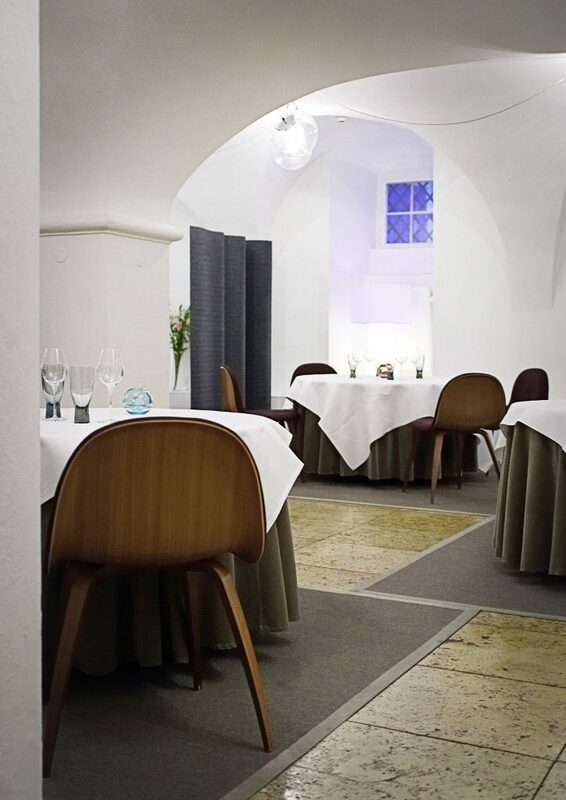 After the snacks, we were taken to our table, a secluded spot in a spacious, white, minimalist vaulted room with minimalist decor and lighting. At this stage, the first wine arrived for our first starter, a 2016 Grüner Veltliner “Handwerk” from Weingut Lesehof-Stagård, Kremstal, Austria. This was a lovely classic Gruner with typical notes of fresh green herbs and the slight spice of lemongrass and white pepper. Very, very refreshing yet most certainly a foodie wine, apt for the forthcoming feast. Our first starter was possibly our favourite dish of the entire feast, a German turnip with apples & Danish oysters inside. This came as a bright green, large, whole turnip cut in two that one had to lift the top off in order to tuck into the pool of juicy, fresh oysters inside. A spectacular sight for the eyes, this paired wonderfully with the Gruner. The second wine we had was a 2015 alvarinho from Soalheiro, Terra Matter. Unfiltered, this was an unexpectedly cloudy, intense, dark yellow wine with a full aroma and complex flavour of fresh vegetal notes. Its early harvest and partial malolactic fermentation in chestnut barrels meant a very complex wine, much unlike most alvarinhos, built for the complex flavours of our second course. This was a small serving of sumptuous sea scallop, presented cleanly in a wide white bowl, served with fermented asparagus and a side portion of hot, baked buttery bread balls. The bread and butter also came out at this point, a heavy, moreish loaf of brown, crusty bread made with beer and a rich golden yellow butter. Both were divine – though the bread was inevitably my favourite, the glutton for good baked goods that I am. The third wine we enjoyed was a 2015 Riesling from Pichler-Krutzler, in Pfaffenberg, Austria. The next dish was yet another masterpiece that our host brought out a table and, quite literally, an array of utensils, to dissect and put together in front of us. 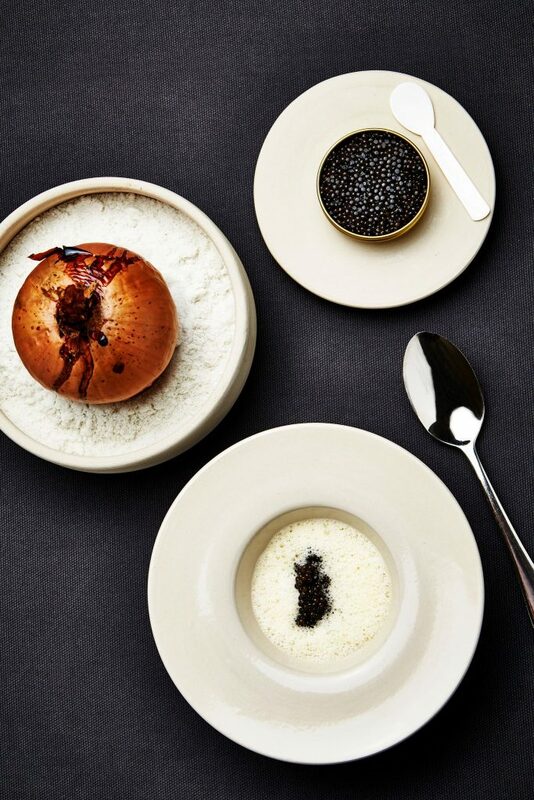 This was a baked onion served with caviar and elderflower. Deceptively simple written on the menu, our host cut a huge baked onion with its skin on into small parts, before ladling a thick sauce into bowls, and assembling the dish together. 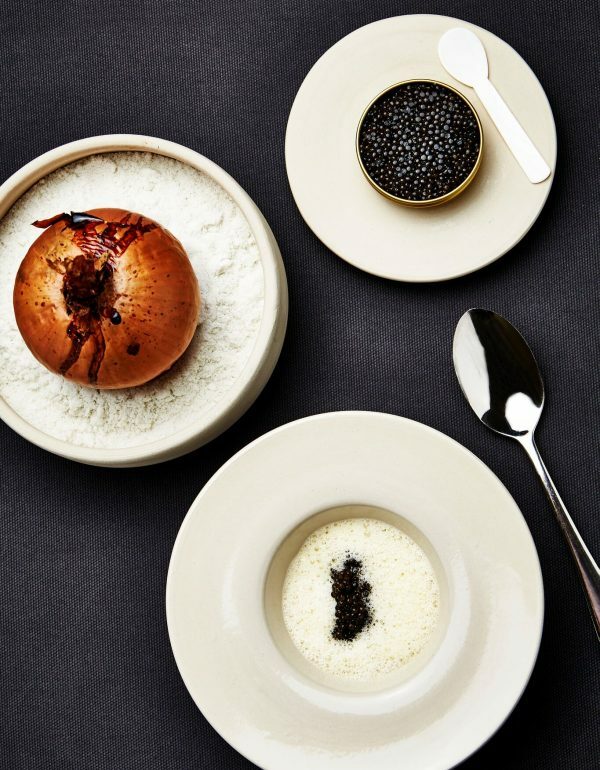 Topped with caviar, and surrounded by another white foam sauce, the onion came as a remarkably elegant, and delicious, course. The fourth wine was a Meursault by David Moreau, the Les Pellans 2015. With this, we had our first serving of the lobster to come, the fried lobster with coral sauce. This was a very fresh and satisfying dish of lobster tail served next to an, indeed very coral in colour, sauce and decorated with edible flowers. The second lobster dish was a small bouillon of lobster and lard served on a bed of wild seaweed. Redolent of an umami style Asian dish, this was satisfyingly clean and wholesome. The fifth wine was from the Sonoma Coast, a Pinot noir named Occidental from 2014. The next course kept with the theme of broths and bouillons, with a ragout of chanterelles served with fave beans and peas. Another interactive dish, this was a bowl of warm ragout of delicious beans hidden wonderfully by a creamy white foam sauce. Delightfully, we were presented with a plate of freshly cut raw herbs and flowers that we were to tear up ourselves and sprinkle over the foam. The sixth wine was a Rioja Gran Reservation Especial Cosecha from 2007, with a beautiful nose of intense red fruits, floral notes and truffles, with hints of spice and incense. The velvety texture was divine, and perfect for the dish to pair. 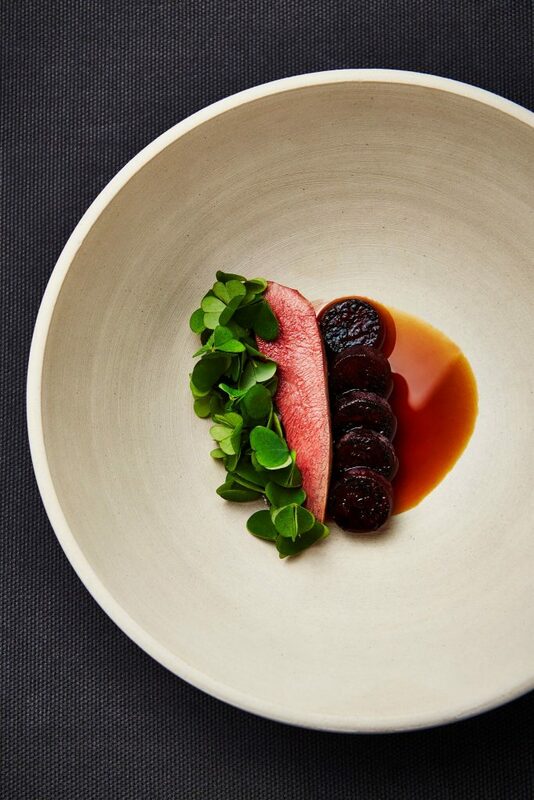 This dish, was a pigeon breast served with grilled cherries and smoked marrow. The pigeon was tender and quite rare, glazed with hearty sauce whilst the smokey cherries added a welcome sweetness. The seventh dish was a lovely, crispy small pancake of offal and cherry chutney, to continue the savoury meat and sweet fruit theme. For the cheese course, we had the Vouvray from Francois Pinon Moelleux 2015. This glorious nectar has a nose rich with syrupy pear and candied quince, topped off with hints of citrus. The mouth was full, ripe, and fat, balanced by a zesty acidity. Delicious – and surprisingly light. The course here was yet another visually enriching experience, as the cheese came out with our host on a tray, before being cut into ribbons that enveloped our plates. Admittedly we were stuffed by this point – with dessert to come – but what we tried was delicious and inevitably of stellar quality. The dessert wine we enjoyed was a 2015 Riesling from Keller. An old and respected producer from the late 80s, Klaus Keller has been making ultra premium German Rieslings in both dry, fruity and sweet styles. This was a mid-range sweet wine, able to stand up to the sweetness of the dessert, yet not one to overwhelm it. The first dessert, which came out with another theatrical presentation of assemblage by our host, was a very Nordic style stone bowl of juniper berries, pine cones, gooseberries and black currant branches. This was akin to a leafy forest flavoured sorbet, refreshing and palate cleansing, yet pleasantly sweet. The second dessert wine was the Chateau Cru Peyraguey Sauternes from 2009. This delectable wine, priced over well into the double figures per bottle in retail value, showed notes of honeyed pineapple, papaya, mango and vanilla with a concentrated, viscous sweetness on the palate. Exotic, honey-laden fruit notes seeped through the nuttiness of the botrytis, making it a sumptuous experience that worked well with the burn notes of the next dessert. 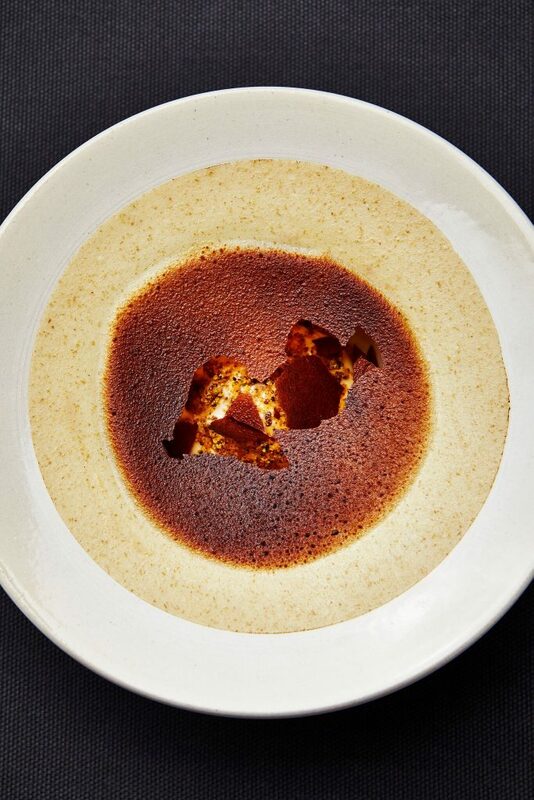 This was a burnt Jerusalem, artichoke with caramel and hazelnut, which was similarly unusually savoury and earthy but with a welcome undercurrent of sweetness that transformed it wonderfully into a seemingly decadent dessert. Our final course was the Petit Fours, which featured a spread of three types of sweets – little soufflé style sweet buns in cute pots, rich chocolate tarts, and two chocolate cherries on a nest of twigs as if freshly picked from the local forests. At this stage of the meal, the finale after three and a half hours, we felt full and satisfied, and perhaps, a little stunned at the experience we had just had. I such, it’s hard to write about such a restaurant as AOC, and do it justice. 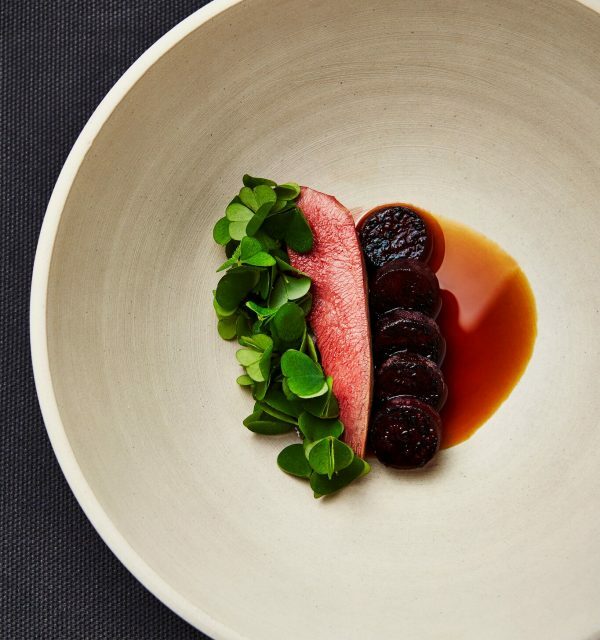 Everything about it – from the grand underground vaults it sits in, the fiercely Nordic ingredients, the theatrical service, to the overwhelmingly complex recipes – demands real life attention. It is a place you have to try to really get. But if the intention of Aaro and Co is to enliven your senses and enrich your soul, then they have succeeded. Try it, and never look back.